We talk to developers Amplitude about their aims and inspirations. This article was originally published in PC Gamer issue 312. For more quality articles about all things PC gaming, you can subscribe now in the UK and the US. The arrival of a new 4X game is a special event in the PC gaming calendar, like a solar eclipse passing across a world split up into tiny hexes. It’s rare enough to feel monumental, yet comforting in its cyclicality; a sporadic dose of complexity reminding us PC gamers that, despite our growing propensity for couch gaming, there are some pleasures that remain unique to us. One year there’ll be a Civ game, another year there’ll be a Gal Civ and then an Age of Wonders. Fill any gaps with meaty DLC, and repeat the cycle. But between 2012 and 2017, a trifecta of games from an upstart French developer shook up this 4X hegemony. Amplitude Studios’ Endless Space (2012), Endless Legend (2014) and Endless Space 2 (2017) reinterpreted the 4X playbook, working within its strict rulesets to push the genre further than it had ever gone before. 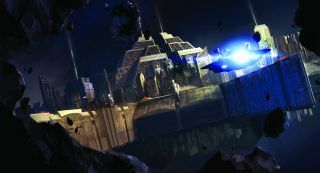 Two of the leading ﬁgures in this 4X supernova are Romain de Waubert, cofounder of Amplitude Studios, and Jeff Spock, narrative director on the series. The Endless games have a strong narrative thrust, interconnected by a story about an extinct, advanced civilisation—the titular Endless—that destroyed itself through inﬁghting. There is no expository intro in any of the games. Instead, you learn about the lore by ﬁnding artefacts, carrying out quests and exploring planets and the vestiges of lost civilisations. Even something as fundamental as researching technologies is a pithy lesson, as most techs in the game originate from the Endless. Even in the short time span between the games, Amplitude has made iterations to abide by de Waubert’s sandbox paradigm. It’s why between Endless Legend and Endless Space 2, the faction quests evolved from linear to choice-driven. At a story juncture for the tree-loving Unfallen faction, for example, you need to pick between showing the galaxy that the faction won’t be swayed from its paciﬁst principles, or—in a ﬂourish of doublespeak—that it’s prepared to defend those principles with force. The quest goals force you to channel production either into inﬂuence or military power, but you can take the path best suited to your unique circumstances in a given game. The faction quests become integrated into the game’s systems, rather than layered over the top of them. An expansionist empire in Civilization may get a unique building with extra productivity and a couple of passive traits to help you spread your borders, an Endless game takes the idea to its extreme. So where an expansionist empire in Civilization may get a unique building with extra productivity and a couple of passive traits to help you spread your borders, an Endless game takes the idea to its extreme. “We’d be in a meeting with designers and say, ‘We need a faction that’s expansion-oriented—they need to keep growing and conquering,’” says Spock. “So maybe it’s uncontrollable population—rabbits in space, you know?” The end result of this thought process was the Craver faction of Endless Space (though the only cunicular thing about them is their invasiveness). These insectoid creatures were created by the Endless for war, and their voracious consumption makes them the only faction to fully deplete planets of all their natural resources, forcing them to move onto the next star system, enslave whoever lives there, bleed it dry, then move on again. The Cravers are incapable of signing peace treaties, so you play in a perpetual cycle of consumption and war. Balance be damned. These kinds of idiosyncrasies exist across most Endless factions. The Cultists can only build the one city but amass armies by indoctrinating minor factions around the world. The Riftborn from Endless Space need to spend industry to reproduce (they’re manufactured rather than conceived). The Roving Clans can’t declare war, and instead exert control through the Marketplace: a global market with a dynamic economy that they can shut other factions out of. A similar approach has since been seen in the Total War: Warhammer series, from Creative Assembly. The fantasy premise has allowed it to let loose with systems that weren’t possible in the historical settings. In Warhammer II, Skaven cities only appear as ruins to other players, while High Elves can manipulate and spy on their opponents via diplomacy. De Waubert reveals that the two fellow Sega developers have been exchanging ideas, but stops short of claiming credit for Total War’s innovations. “We try to learn from their experience, and share everything we can with them,” he reveals. All these asymmetries and imbalances may sound intimidating to the 4X outsider. But where the blockbuster Civilization series is, to an extent, fettered to its own legacy, and inhibited from making drastic changes to make it more accessible, Amplitude got to approach the genre afresh, with a new generation of potential 4X gamers in mind. “When you’re starting on a blank page, you can do things differently,” de Waubert says. “Half the effort with traditional 4X games was trying to ﬁgure out the interfaces,” says Spock. “You’d have to click through three menus then ﬁnd a slider bar and under that you’d ﬁnd another few options. We wanted to put an end to that.” Take the ‘Citizen Management’ screen in Civilization, where you assign population to gathering science, food and industry. For years, it’s remained largely similar—a system where you assign citizens to speciﬁc tiles surrounding the city, counting the amount of each resource on each tile. The Endless series simpliﬁes this by not even having a separate screen for managing city production, but a small table overlay where you can drag and drop citizens between the resources you want them to generate. All the info you need is right there in the table, and the effects are immediately obvious. Spock says that the goal of this “beautiful, streamlined interface is that the player could get anywhere in two, three clicks”, but that doesn’t capture the omniscient feel of managing your empire in Endless Space 2, where you can seamlessly zoom from a galaxy-wide view to a star system to a planet in a couple of seconds by scrolling. Press the spacebar on a planet or star system, and you ‘scan’ whatever is highlighted. The interface posits you as an emperor, interacting with your hologram terminal, using graceful hand gestures; it feels like a modern, less intrusive answer to those clunky metallic interfaces of ’90s titles, like Fallout and Alpha Centauri, which aims to immerse players by allowing them to look at the game world diegetically. The interface posits you as an emperor, interacting with your hologram terminal, using graceful hand gestures; it feels like a modern, less intrusive answer to those clunky metallic interfaces of ’90s titles. Five years on, and Amplitude has created the ﬁrst great 4X series of the Early Access generation and a distinctly modern classic of the genre, offering a fresh perspective that the stalwarts are already learning from. They’ve overcome longstanding 4X problems, combating mid-game lulls with compelling narratives and creating interfaces that aren’t tied down by a lineage dating back 15 or more years. De Waubert assures us that “this is only the beginning” for the Endless saga—the ﬁrst intrepid turns in a new instance of the 4X game, where rules are being broken and balance has been thrown out of the airlock for the better.